Student Contributors: Arun A., Abhishek Basu, Gowri S.
Public healthcare systems receive a large allocation in every budget. The system, though, is plagued by many ills that make it inefficient. Is there a way this can be improved? A case in point is the successful procurement system followed by the Tamil Nadu government. This article proposes a similar centralized approach to drug procurement and delivery. As high as 10% of the government's health budget that is made available to government hospitals and health centres goes into the procurement of generic drugs. Because of the high volume of drugs to be procured and the checks & balances inherent to government operations, the system in its current form is far from efficient. Can the system be revamped to make public health care cost efficient? According to WHO studies1, approximately Rs 2000 crores was spent in India by the state and central governments together on procuring drugs and medicines during 2001-02. In addition to this, a few international organizations also fund specific programmes like leprosy control either through the central government or directly through the states. The expenditure pattern on drugs shows wide-ranging differences across states, from as little as less than 2% in Punjab to as much as 17% in Kerala during 2001-02. The backward states, both in economic and health indicator terms, incurred the lowest expenditure on drugs. Given the limited resources of the government and the multiple demands on the same, it is imperative that optimum utilization is made of the available resources. With the government increasing the public healthcare spend from 1% of GDP to 3%2, efficient resource utilization becomes even more important. Efficient procurement policies have a significant bearing on ensuring that the right medicines are secured in sufficient quantities at the lowest possible price. Till 1994, all states were following a system of decentralized procurement. For e.g. in Karnataka, around 60% was sourced by zilla panchayats at the district level, while the remaining 40% was sourced by government medical stores. This system had a lot of disadvantages, and especially allowed a lot of room for corruption. A Lok Ayukta report released in 2005 says, "Decentralized cooperation in Zilla Panchayats was detected in the procurement of forged, substandard drugs from unlicensed manufacturers at very high prices3". In 1994, Tamil Nadu Medical Service Corporation (TNMSC) set up a pioneer system for drug procurement and distribution. 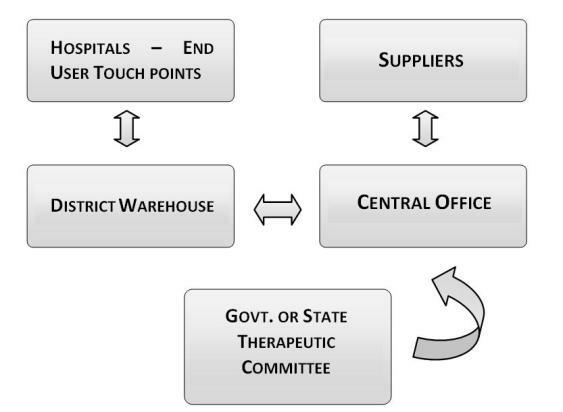 The essence of the system is centralized drug procurement supported by a computerized system of drug management. This system has been copied almost in its entirety by some states like Karnataka, Kerala, Rajasthan and Himachal Pradesh. Under this system, there are warehouses at all district headquarters from where supplies are provided to hospitals and other health facilities4. Each district warehouse is linked via internet to the central office. Exhibit 1 shows an overview of the system. It is the central office that collates requirement from the different districts, selects the suppliers, does order placement and settles the payments with them. The suppliers do the delivery directly to the district warehouses. A passbook system has been introduced where the entitlement of each hospital/health center is given in monetary terms. This allotment is done considering factors such as number of beds, population it caters to etc. The institution can obtain any drug in the approved list (prepared by the State Drug Therapeutic Committee) if funds are available in the passbook. The receipt and issue of drugs are computerized resulting in instantaneous adjustments to the stock position. While brilliant in concept, the system faces a lot of challenges in implementation resulting from its scale, and failure to adopt best practices. The supply chain is severely constrained from both the supply and demand side. Tamil Nadu procures 268 items of drugs and medicines; Karnataka handles circa 550 drugs. This entails collaborating with multiple suppliers. At the same time, on the demand side there are over 2000 institutions for which the procurement is made. This means handling large quantity orders from multiple suppliers; and re-routing the same to a large number of institutions. Our research shows that generally there is a bulk order placement at the beginning of the year, and suppliers are asked to deliver the entire annual requirement in 2 batches within 60 days. This system causes suppliers to often skip their schedules, resulting in a 10% default rate to hospitals. Additionally, since the district warehouses store the drugs till the hospitals come to collect their requirement, the warehouses are constructed with more floor space than required; and the available space is over-utilized in the beginning of the year, and under-utilized near the end. A more serious issue affecting the efficiency of the whole system is the under utilization of IT systems and lack of transparency. While the system has been designed for instantaneous updates of stock positions; in practice it's a data entry operator who performs this operation manually at each warehouse upon the receipt of orders from suppliers and issue to hospitals. Barring TNMSC, no state has yet incorporated a system whereby the hospitals can check the stock positions of requisite drugs prior to embarking for collection, and warehouses can themselves check stock positions in other warehouses in order to facilitate movement of drugs from one warehouse to another based on needs during shortages. States are currently figuring out what should be done regarding quality assurance. The supplier selection is done after screening them on stringent criteria. However, barring TNMSC, no state has yet implemented a consistent scheme for quality checks on all the batches received. TNMSC sends all batches for laboratory checks prior to distribution. This system is costly, and time consuming; but ensures that drug quality is not compromised. The reason is largely the scale of operation required. Given a procurement of around 300 drugs, distributed across 15-20 warehouses, how do the states implement a workable and yet cost-effective system of quality checks? Practical solutions are needed to address these challenges before we can sit back and conclude that the centralized DDS has achieved its objectives of providing the right drug to the right patient at the right time at a minimal cost. The government needs to trust the suppliers and give them a delivery schedule staggered across the year. This will eliminate peaks and troughs in warehouse utilization, and also eliminate the extra costs due to warehouse defaults to hospitals. E-governance is seen as a promising option to improve the transparency of the whole system. However, considering the capital investment that is required, the following two phased system will help in better implementation of e-governance. In Phase I, the aim should be to resolve the problem of over-utilization of the warehouse staff. This can be achieved by shifting the load from the warehouse to the supplier side. An internet portal should be developed and used as a common link between the suppliers and warehouse. Before the delivery to the warehouse the supplier enters all the critical information like batch number, expiry date etc in the portal. At the warehouse, these details are verified and the drug delivery is approved. This saves manual entry time which can instead be used for quality checking, a more important job. Also this data should be directly registered in the centralized database which should be accessible by all the warehouses. This way it is ensured that drug levels are monitored in each and every warehouse, thereby leading to cross warehouse drug delivery at times of emergency. The Phase II recommendations are built on a vision to make the entire system connected. At this stage the end result would be a seamless and networked system from the supplier to the hospital side. In this system, all the hospitals (at least the major ones) are connected. When the hospital requires drugs, it places the order of what drugs (in what quantity) it needs with the central server. The central server sends the request to the nearest warehouse with the requirement. The warehouse then dispatches the requirement to the hospital after ensuring that the request is in the drug eligibility list and is within the annual budget. Essentially, the hospital visits to the warehouse are eliminated in this system. This system can be primarily implemented in major hospitals. 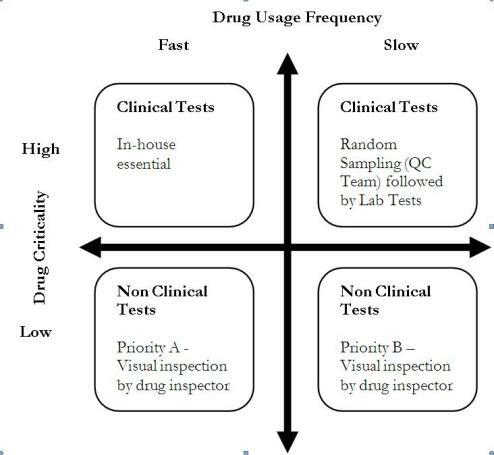 We divide the drugs that would come to a warehouse into four categories based on two dimensions: drug criticality, and its usage frequency as shown in exhibit 2. Quality Control for these four categories would be implemented differently. Drugs that are fast moving and critical, require in-house quality inspections. Since they are critical drugs administering them to patients without quality checks would be hazardous. Drugs that are critical, but slow-moving can be randomly sampled by the QC team and sent to labs for getting the clinical tests done. For drugs which are non-critical, that the current system of checks would suffice. The drug inspector should classify the drugs into priority A (non-critical, fast moving) and priority B (non-critical, slow-moving) in deciding which drugs should be tested first. There are simple visual inspection checks that the QC team can do for every incoming batch of drugs. The QC team should be given the Visual Inspection Toolkit for doing the same. The tool kit will have simple questions that can be answered with a Yes or No. The questions pertain to packaging, and physical characteristics of the tablets/capsules. Refer to the Exhibit 3 for a sample. The centralized procurement system has clearly demonstrated its superiority over the decentralized system. A decentralized system in which different institutions float separate tenders for procurement is vulnerable to wastage of time and funds, mistakes, corruption, and pilferage. In contrast, a centralized, pooled procurement system will minimize the costs and maximize the quality of procured drugs, especially when the tenders are floated by an autonomous agency that specializes only in procurement. However, the centralized system should ensure that suppliers are given a staggered delivery schedule in order to maximize the installed capacity utilization and eliminate stock-outs. Further, efficient division of labor between the supplier and the warehouse; and ensuring transparency; would help build a seamlessly integrated system; networked end-to-end. And most importantly, when the distribution is decentralised, it is time and cost efficient to decentralize the quality control. The system should be based on drug dynamics and be customized for the different medicine categories. Shaktivel, S, 'Access to essential drugs and medicines', WHO study, www.whoindia.org/LinkFiles/ Commision_on_Macroeconomic_and_Health_Access_to_Essential_Drugs_and_Medicine.pdf. Last accessed on October 31, 2008. The Hindu, September 27, 2008, http://www.hindu.com/2008/09/27/stories/2008092759971000.htm. Last accessed on December 7, 2008. 'Epidemic of Corruption in India', http://www.karunatrust.org . Last accessed on October 31, 2008. Tamil Nadu Medical Services Corporation (TNMSC website), http://www.tnmsc.com/tnmsc/tnmsc.htm. Last accessed on October 31, 2008.